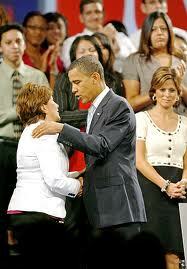 Janet Murguía heads the largest Hispanic civil rights and advocacy organizations in the nation. Carson, Ca. - On May 20, the California State University, Dominguez Hills, will present an honorary doctorate to Janet Murguía, President and Chief Executive Officer of the National Council of La Raza. Named as one of the "100 Most Influential Hispanics" by Hispanic Business Magazine, Murguía heads the largest Hispanic civil rights and advocacy organizations in the nation. A former legislative counsel to former Kansas Congressman Jim Slattery, Murguía became a key figure among Latino community leaders when she was named as head of NCLR on January 1, 2005. In addition, she has served as deputy assistant to former President Bill Clinton from 1994 to 2000, and as deputy campaign manager and director of constituency outreach for the Gore/Lieberman presidential campaign. In 2001, Murguía joined the University of Kansas (KU) as Executive Vice Chancellor for University Relations, overseeing KU’s internal and external relations with the public, including governmental and public affairs. She coordinated the university's strategic planning and marketing efforts at the four KU campuses with those of the Alumni Association, the Athletics Corporation, and the Endowment Association. Murguía is currently a Board member of the Independent Sector, a coalition of leading nonprofits, foundations, and corporations committed to connecting, informing, and advocating on behalf of the nonprofit and philanthropic community. She is also a member of the Merrill Lynch Diversity & Inclusion Council and is an executive committee member of the Leadership Conference on Civil Rights. In addition, Murguía sits on the Board of the Hispanic Association on Corporate Responsibility and the National Hispanic Leadership Agenda. Janet Murguía grew up in Kansas City, Kansas, where she also attended Kansas University and attained degrees in Journalism, Spanish, and a J.D. 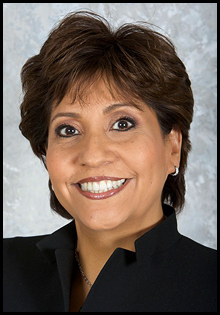 Murguia will receive CSU, Dominguez Hills honorary doctorate at the College of Business Administration and Public Policy at a ceremony planned for 6 p.m. at the Home Depot Center tennis stadium on campus.